—If your beliefs stem from a religious source, they are PERSONAL and should be hidden from sight lest someone else think you might be forcing them on some innocent bystander. It is downright impolite to even mention your crazy inappropriate religion-fueled beliefs in front of someone else who does not have exactly the same religion-fueled beliefs, because even the mere statement is a judgement upon the other person for not believing the same thing. In this case, beliefs are not restricted to articles of faith, such as believing in a particular deity, nor practices of faith, such as keeping kosher. “Beliefs” in this case cover everything from one’s philosophy, morals, and opinions, to scientific evidence and the results of reputable studies. If it happens to be compatible with your religion (or any religion even if it’s not yours), it’s inadmissible, not to mention gauche. There are a few religions which get free passes, though. —If your beliefs stem from anything other than a religion, then they should be forced on other people as often as possible! They are no longer considered “beliefs” or even “positions” or “opinions” but are rather treated much the same as cold hard facts which other people must be made to view exactly the same way you do, and they must be made to react to them exactly the same way you do. Whether these beliefs come from economic theory, quotes by political leaders, one’s own particular brand of logic, or inspiration borne of a dream had after eating far too many past-due pork rinds, they are perfect shining lights with which to lead the masses to The Future, whether they like it or not. —Mary is against government coercion of companies to provide free contraception in their health care plans, especially if the people responsible for funding that insurance coverage have a moral objection to doing so, based on her knowledge that regular sexual activity is not a basic human need without which human beings will suffer and die, and contraception does not treat or cure any illness (and either is incapable or is not 100% effective at preventing any, either). Mary is told to stop trying to force her beliefs on other people. —Martha says that all women need immediate access to free contraception, so all companies must be forced by the government to include it in their health care plans backed by the threat of fines and other legal actions, based on her belief that no women cannot possibly live decent lives without having regular sexual activity and regularly using contraceptives, coupled with the belief that all women are oppressed if they do not have access to free contraception covered by insurance. She is applauded and allowed to go forward with her plans. 2. I’m not as cool with stretch marks as I thought I would be. (Note for context: I dinged 28 weeks on Friday.) I don’t have any on my belly, and I’m pretty sure I still wouldn’t care too much about those since I already have growth spurt stretch marks across my hips and lower back anyway – classy thin silver lines by now – but now I have these short but THICK purply-red squiggles on my chest… Not Happy. I know that they’re largely caused by the utter ridiculousness that is trying to find the proper size of nursing bra in my area. Target carries almost nothing even close to my size to try on, Walmart doesn’t have a maternity section at all, and I don’t want to drop $40+ on a dang bra, so I did some measuring and online shopping just to find out that bra sizes, even though EVERYONE pretends that the band and cup size correspond to real numbers, are actually lying. I ordered the exact same size from two different stores, just to find out that one is a little too loose even on the smallest hook setting and the other is just barely too tight even on the widest hook setting. I laid them flat and there is almost a two inch difference between the two bands. INFURIATING. On the other hand, the position of these stretch marks is making me face some things that I hadn’t really considered before. If anyone had told me, “You know, motherhood changes your whole life and you can’t just go back to the way things were except with the addition of a baby and all its responsibilities,” I would have said (to myself) Well DUH, I know that, I’m ok with that, it stands to reason, and that’s not what I’m expecting to do anyway. But I found out several days ago that two of my favorite bands (although technically one and a half, sort of, since one of them switched out the lead vocalist and is going in a slightly different direction than I’d like) are coming to the area in October and the ticket price is not insanely high. At first I thought awesome, I’ll be over 3 months postpartum so I can rock out without worrying, hopefully by then my husband will be getting used to this whole being a dad thing and won’t mind a whole evening of being in charge all by himself, and best of all my body will be back. Ah heh heh, back it up lady. Now I will have big ol’ stretch marks all over my decolletage. I didn’t even know how attached I was to being a certain kind of young and attractive, and now at the first hint of that changing or being taken away, I’m all a-quiver. Guess I’d better sit down and work through it. 3. My parents and sister have been helping me de-clutter, clean, and organize the apartment over the past couple of weeks. Right now the last of the stuff that needs to get sorted through, junked, donated, or put away is piled in the living room. I’ve gotten down to the difficult things and I just don’t want to touch them… Blargh. I also don’t want to change out the tired-looking flowers on the altar. Well, I want it to get done, and doing it isn’t the problem, I just don’t want to get started. Inertia – gets me every time. :( Maybe the guilt provoked by telling everyone that I’m a lazy slug-a-bed (couch) will spur me into action. 3 1/2. 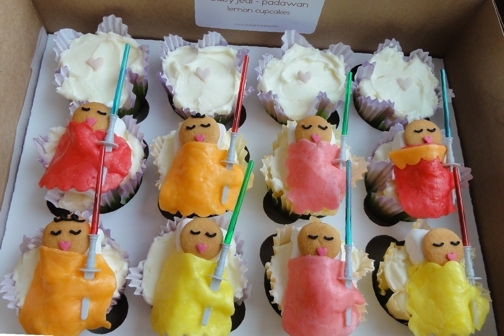 I spontaneously put “star wars cake pan” into my search bar and one thing led to another when……. I FOUND THIS. Tiny baby Jedi! Although really, what responsible mother would let her Force-sensitive baby go to sleep with Daddy's lightsaber? This entry was posted on Tuesday, May 1st, 2012 at 6:35 pm	and posted in Uncategorized. You can follow any responses to this entry through the RSS 2.0 feed.